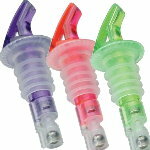 Measured liquor bottle pourers help bartenders control the amount of liquor being mixed into drinks. 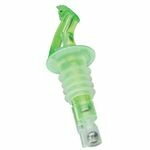 These pourers are designed to ensure steady pouring with approximate portions and less spillage. You’ll also produce drinks with consistent alcohol to mixer ratios. By using these accessories on standard bottles, the amount of wasted product and lost profits from over pouring will be greatly reduced. 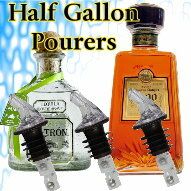 Measured liquor pourer Precision Pour standard style spouts are our most cost-effective spouts. The lack of a collar and a fliptop seal keeps the purchase price down, but the performance of the spout is undiminished. 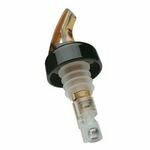 Precision Pour flip top seal spouts protect your liquor inventory against fruit flies and contaminants. When your bottles are upright, the closed flip top prevents anything from entering the bottle. Precision Pour collared spouts are a nice cosmetic upgrade from our standard style spouts. 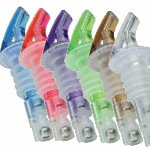 The collar covers the threads of a bottle as well as any exposed fins on the spout stem. Also, our collar is locked on to the stem of the spout. extra-large fins on the stems of heavy cork spouts make them able to fit oversized bottle openings. Heavy cork spouts fit most 1.75 liter bottles and brands such as Patron, Cuervo 1800 and Cabo Wabo. 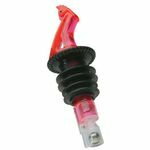 Precision Pour heavy cork fliptop seal style spouts are similar to our other fliptop style spouts with one major exception: extra-large fins on the stems of heavy cork spouts make them able to fit oversized bottle openings. Precision Pour collared & flip top seal spouts are our fully-loaded style of spout. These spouts offer the cosmetic benefits of the collar. Also, the flip top seal protects against contaminants and fruit flies. 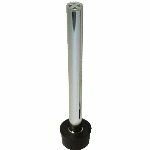 Precision Pour 3 Ball Liquor Pour spouts are the most accurate, most durable, most reliable measured pour spouts available. With Precision Pour liquor pourer bartenders can pour accurate shots without using a shot glass or jigger. This speeds up drink production and leads to great tasting, responsibly poured cocktails. 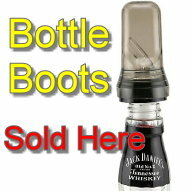 Choose from measured liquor bottle pourers with or without collars. 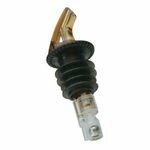 Options with collars help the pourer remain firmly attached inside the bottle, ultimately reducing leaks. Styles without collars allow bartenders in high volume establishments to pour drinks faster. You’ll also find that these units are available with different colored bases. This color coordination system helps staff easily identify the amount each pourer dispenses at a time. Serving alcohol responsibly is not just the right thing to do, it is also best for your business. Any legitimate bar owner knows this and yet, it isn't always easy to do. Irresponsible service means, obviously, serving minors and serving visibly intoxicated customers. It also means serving overly strong drinks. Though there is no "cure-all" solution, Precision Pour® 3 Ball Liquor Pour spouts can at least make it easier to track who’s had enough and who might have had too much. When not using a measured pour spout, or another accurate measuring system, it is definitely harder for bartenders to keep tabs on the customer's consumption. Precision Pours, Inc., supports a number of organizations that offer information and resources to the hospitality industry. In this portion of our web site, you'll find links to organizations that are doing a great job helping both our industry and our customers. Please visit frequently for updates and to join us in our efforts to promote responsible service.